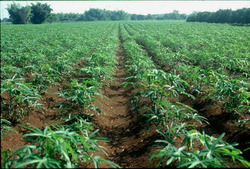 The agricultural transformation policy of the Ogun State government will soon get a major boost as the state governor, Ibikunle Amosun launches a 10-hectare cassava pilot farm promoted by Caterina de’ Medici Africa Projects Ltd (CDMA) at Ikenne. The pilot farm, which will serve as a prelude to a bigger 4,000 hectares cassava farm to be supported by Thai Farms International Ltd and other investors, is supported by the USAID-Nigeria Expanded Trade and Transport Program (NEXTT) and several local banks. Foluke Michael, principal partner of CDMA, said the project will adopt modern farming methods, conduct training for local farmers, supply the farmers with agro-chemical to improve farm yield, and provide other extension services to all its partners. “The partnership with the state will also help to build public infrastructure changes in agricultural policy,” she said….